This topic contains 49 replies, has 14 voices, and was last updated by Anonymous 10 years, 7 months ago. 1 of 4 Spaniards wants to recover the Peseta currency cause they think the cause of the Spanish economic crisis is the euro. I personally think that this will drive Spain to the same way that Argentina some years ago but surely ocasional europeans holiday makers would cheer such a idea. You have € or $, pesetas etc. Or money printed with Micky mouse on it. As usual Spaniards are oblivious to the fact as to what makes a currency strong. Good & prudent Government, independent & transparent & functional judiciary and reasonably efficient buecracy. Sadly, Spain does not have the above to a level which will encourage the locals or foreigners to invest & work hard, for the rewards and in turn making the economy strong. And nearly 60% say it has been a drag on the economy. And they haven’t gone into recession yet! I agree and I don’t think Spain deserves any better even if I will feel sorry for certain individuals. I am also suprised that the figure of 1 in 4 wasn’t higher. I guess if this question was asked in Germany, Holland etc it would bring the same or a higher figure. Not, many Gardeners are good mathematicians !!!!. Than again not many mathematicians are Botanist either..
Having a strong currency IS the problem not the solution! What they really want is a weak currency, so they can inflate all their debts away and attract millions of tourists who can get lots of “pesetas” to their pounds, dollars etc. The problem they have is that they have no control over their own their own interest rates/printing presses. No one is coming to Spain as it is too expensive! In 2000, the last year of the peseta you could get 281 to the pound, meaning a 100 peseta glass of lager cost approx 36p. Now a 1.50Euro glass of lager is 1.23…nearly 4 times the cost! It was not my intention to turn the thread on the merits of strong v weak currency/economy. When I did my post I had the example of Argentina in mind. Yes, I do recall the exchange rate. My first property was bought with that kind of exchange rate. Guardamar del Segura, Costa Blanca during the recent heatwave. Whether it be cheap Pesetas or expensive Euros, it looks like the tourists just keep on coming anyway. Unless of course all these people are simply homeless – victims of illegal off-plans, maybe a villa-in-the-sun that never got built or worse… got bull-dozed. The only reasons I can think of for willingly wanting to sit amongst this lot. I agree with Shakeel’s view and certainly don’t believe reverting back to the Peseta will save the day or cure Spain’s woes. Busy here too Charlie. Mostly Spanish though and not big spenders. Chiringuitos are fairly quiet compared with previous years. When we were in the CDS in late June, we remarked on the fact that we were surrounded by Spanish on the beaches. Very few Brits, compared to the previous 5 years we have been going there. The Spanish never seem to stop talking, and loudly at that! There were many days we left the beach early as we couldn’t stand the noise! The Mediterranean are gregarious people and this reflects in their behaviour. Just go to a bar & see the steam from the coffee machine, friut machine, slamming of china/cutlery, loud music as the music is loud so to be heard the customers have to raise their voices. You just have to be in any of the cities old part where the windows are opened and the TV blaring away. If you have to go to a bar for a quite drink or feeling a bit vulnerable, you better not go anywhere. So, why go to Spain? Very busy here, around Elviria CDS, good value Spanish restaurants very busy others less so, which I think is a good thing. Strangely we like things that are Spanish, that’s why we own and come here for every school holiday. For real volume, you can beat an Italian campsite I once stayed in set amongst a pine forest. The ‘babble’ was so deafening, the trees vibrated! An aspect of life in Med. countries that can’t be denied but doesn’t mean we hate the place because of it. For a quite holidays . I suggest Gods waiting room of Eastbourne & Devon. just come back from a holiay in Italy on a large campsite set in a pine forest (outskirts of Lido de Jeselo, called Malibu Beach resort). Had a lodge facing direct on to beach. Didn’t find the Italians as loud as i thought they would be, (only about 5 UK families their, almost all Italians) and the driving was a better standard than UK, so many adults cycling with very young kids on the back/front of push bikes. My first time in Italy, so visited Venice (only an hour south) as well as all other family beach holiday activities, and a great time. Mosi’s bad though, got eaten alive! Thought the Italians in the north were more like English than Spanish, which suprised me. Pleasent enough people who tend to keep themselves to themselves. No louts, thugs, drunks etc. Glad they don’t have the very annoying Spanish habit of having a television outside blaring away outside their tent/lodge. If anything though, i missed the ‘buzz’ of the Spanish, and the sense of fun we have had in some of the big Spanish campsites. The Italians in the north are quite big on rules and regs’ which again suprised me. Having said that, i’ve heard a real UK type thug/slapper element is taking over in the superb large campsites on the Costa Brava/Dorada? The planning in Italy is fantastic compared to poor old Spain. Very few building sites/cranes, hell holes nobody wants to look at. Will it be next though i wonder? Cheaper flights than anywhere else in Eurozone in high season. To compare Spain with Italy. You have to compare South of Italy with South of Spain. Indeed the Northern Italian are more English. In fact I compare my northern Italian friends to Southern Germans. That’s a good reason to go on holiday there, not a very good reason to buy property there. Where will they get the water from and at what cost? Thanks for the tip, to be honest Katy (and as boring as it sounds) my kids (and mum and dad) are happy with beach and pool locally. Every year we plan to do more but even though we’ve been here three weeks we’ve still not got round to it. I make a note and try your recommendation on our next trip. Well it rained in November, February and May when we were here and as far as I’m aware there are no restrictions as yet. So in answer to your question i guess rain and desalination or was it rhetorical? Sorry, no time to respond to silly comments. I’m busy packing for our holiday to Majorca. The Ministry of the Environment has warned that one third of Spain is at “high” or “very high” risk of turning into desert, with 90 percent of Murcia, Valencia and the Canary Islands, plus 40 percent of Catalunya in particular danger. Of course they can build desalination plants but the water will be expensive. How much water would they need to prevent large parts of Spain becomming desert? And can they do it? Nature is a pretty determined beast. So by not owning, and only coming here on holiday I can help? I’m sorry i don’t get it. Of course they can build desalination plants but the water will be expensive. How much water would they need to prevent large parts of Spain becoming desert? And can they do it? Nature is a pretty determined beast. Ever been to UAE they’re turning desert green. It’s easy really Paul! For those who take a holiday in Spain say for 2-4 weeks pa. there is a finite amount of water that will be used during that period. If thousands more properties are built for people to live in then they will need water 24/7. (pretty much). Even people who have holiday homes need water for the gardens most of the year + swimming pools. It all adds up. How in Gods name we got to this in this thread I’ll never know. Your argument is total rubbish in many ways, the place you are going to in Majorca is maintained 24/7. They don’t water the gardens and fill the pool just for you (“Quick Clarie’s coming fill the pool”). The article also talks of poor agricultural practices are you suggesting we stop buying Spanish onions and tomatoes until these Spanish people understand!!! Come on get a grip. It wasn’t long ago the UK had droughts each year (hose pipe bans etc down your neck of the woods.) It hasn’t stopped raining since in the UK. Even the article says “The past year has been one of meteorological extremes worldwide, and Spain has been no exception.” To make it clear the whole world is having extremes of weather last year and Spain has not escaped. As I’ve alluded to earlier it’s hot here now but it rained (and i mean rained) November February and May here, and they are not short of water here, although they were three years ago when we had to stop watering the gardens in our development. There is surplus in the province of Navarra. The Government of Navarra is not keen on channelling to Murcia. The reason this has gone off topic is because someone chose to make a silly remark about a minor/flippant comment, (mine) and then someone else jumped on the bandwagon. 🙄 Go back to the beginning of the thread…you’ll see where it went pear-shaped. There was no argument from me. They don’t water the gardens and fill the pool just for you (“Quick Clarie’s coming fill the pool”). Why make it so personal Paul? What has my holiday got to do with it? The forum has been pleasant lately without these personal attacks. You’re welcome. I think all aspects of an investment should be considered when considering whether it is viable long term. Yes, but they have the money to do so. Why make it so personal Paul? You’re far to touchy Claire it wasn’t meant as an attack, you choose to answer a question that I asked of Mike and i replied. If you do that, I’ll respond to you personally without i think being personal, if I’ve a mind to. You do seem to have missed the point which was ALL holiday destinations use water 24/7 whether you’re there or not, dare i say including your holiday destination. Therefore saying it’s really easy to work out, as my holiday destination (i.e. an owned apartment) needs more water than a holiday hotel (with gardens and pool) is rubbish. But well done you for not wasting water on a pool. The Euro, i think it’s here to stay with those that have it. As for the Spaniards still using the paeseta, i tried to explain to my six year old the correlation between meters, centimeters (in genral use) and miles (how many miles to go Dad) this week (answers on a postcard please !!!). i think every society has a hangover from the old to the new and this is not a sign of rejection of the new. It’s not really an investment more of a holiday home, but i do understand what you mean and i concur, I just don’t know what I can do apart from going without holidays. That would be extreme even for me. I was speaking more of Spain as an investment now and for many reasons I would consider it a bad idea now. But for those who have property there then I would agree, it’s a great holiday location which has its ups and downs over the long term. Continuing off-topic, there is an article in today’s Diario sur which says that the water situation in Málaga City and the surrounding area is faced with serious shortages. There was 16% less rain than the year before and 40% below average. Nature is a pretty determined beast. Mike – so are the rogues. A couple of years ago I remember reading about half a million illegal boreholes, with people stealing and selling the water on the black market to farmers and developers. “The Valencian housing minister has bizarrely described golf resorts as “a new kind of agriculture” and even appealed to the European Union to allocate farming aid to such projects instead”. Have to give him ten out of ten for imagination and cheek….but then he’s from Valencia where Land Grab was invented. There were water taps from the various rivers and lakes/resevirs in the streets but they got cut off and plugged as many people would go along with plastic bottles, fill up and then sell it to unsuspecting tourists! Things are no way that bad now and every year there is a cry of not enough water. I have been genuinely amazed at how much construction there is and still no sighn of restictions. Apparently la conception resevoir is fine adn the Istan lake still looks pretty full to me! 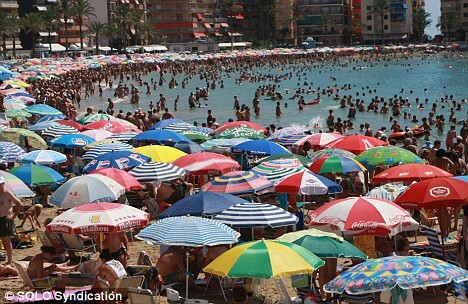 Spanish tourism chiefs have launched a new offensive to tempt holidaymakers in winter amid falling visitor numbers. The new “Winter in Spain” campaign is expected to ditch its traditional image of sun, sea and sangria in favour of snowy mountain ranges and outdoor pursuits. “It’s a proposal by the government to attract people outside the usual summer holiday period. We are renowned for our sun, and that sun shines all year round,” said a Tourism and Industry Ministry spokesman. The new campaign will be launched in earnest following a brainstorming meeting in Seville at the end of September. It comes after the numbers of tourists from abroad dropped eight per cent in the peak month of July compared with the same period last year. In particular, the Swiss, French and Italian tourists stayed away, with top Spanish destinations of Catalonia, Andalusia, the Canary Islands, Valencia and the Balearics hardest hit by the downturn. Even Spaniards have cut holiday spending by 30 per cent. The Spanish government has pledged 500m euros to update tatty hotels and resort installations, but the effects will not be felt until next year. Spain is planning to set up tourism offices in Russia, China and India. By the time the consulate process the visa the summer/winter will be over. I recall a family friend who has property in Marbella, wanted to invite his mother, who would have stayed in her sons property. The consulate asked him to bring an invitation extended to her mother by the Marbella police. Needless to say this could not be done. On my recent visit. I went to the Marbella main police station to try how this works. The police officer who I dealt with said he does not know of any such requirements and why should the police invite a visitor. For once I agreed with the reasoning given by the police. ….. the numbers of tourists from abroad dropped eight per cent in the peak month of July compared with the same period last year. So the number of tourists from abroad this July was 92% of last July’s total then. Not quite ‘no-one’, is it. Actually, considering the credit crunch and apparent belt-tightening I am surprised the percentage is this high. Spain has done well. Eating out in restaurants is always the first to go in times of belt-tightening. Same world over. I don’t think anyone can expect miracles when it comes to the actual spending power of tourists in the current climate, am sure many are just relieved to have hotel beds as full as possible. While this topic is now truly off topic and as one could easily misunderstand shakeel’s typo i felt i must share this forum entry which i spotted sometime ago on another forum. So I gather one sunny afternoon in Mijas, a donkey managed to plant a big smackeroo on you Shakeel???? Paul – I sometimes think we have a few ‘Melvins’ on this forum! Actually, when threads here go off topic at least they generally still stay (albeit vaguely) on Spanish property matters even if it has wandered away from the original subject. I look at it like a group of people round a dinner table – ‘conversation’ will often follow loads of different avenues, one thing said leading off at a tangent. Human nature really and as long as it doesn’t get personal/rude, no harm done. Let’s face it, there are some threads where all that can be said has been said and there’s simply nothing more to add on the subject. Some of the off-topic discussions can be just as interesting as the original subject as long as it is a topic and not just a disintegration into silly arguments. If someone has something to say about the original subject they can always jump in at any time. I should be so lucky. The truth is that I have never been to Mijas & I only referred to it from the post card & articles written about Mijas. Could it be the “Kiss me quick hat” the donkeys were wearing in Blackpool ??? I should either stop drinking or stop travelling. Next I will think Eiffel tower is in Pisa. I see that as usual, this forum has gone completely off message & with one exception, no-one is commenting on the fact that 3 out 4 don’t want the peseta back. I see as well that the Spanish government has released visitor figures for January -June 08, 26.6 million people, up 10% on the same period in 2007. The post office has reported the demand for Euros in June & July this year is up 8% on the same period last year. Yes, the way developers & agents have behaved in recent years is appalling but action, (too little & too late for some) is being taken, & it is when things slow down that the dodgy companies go under, they can only survive in a boom market. We are only at the start of a major shakeout in the Spanish market, it has already claimed ‘victims’, with Parador going in the Uk, & I’m sure other companies operating the same way will go as well. What has to happen through this & other forums, & publicity generally, that when the market improves, which it will do at some point, that people are not conned again! agents have to be regulated strictly in Spain (& UK), & the Spanish government has to ensure that developers follow the existing laws. I know, I’m an optimist! but it may happen! i wonder if the housing market in Spain will ever really recover? The massive supply over demand situation, the unfinished and ugly developments along much of the cost, the lack of regulation, and hopeless slow legal system in many cases, and falling prices, and rising cost of living, makes it hard for me to see why many people would see investment there in the future as a wise choice? Of course some will always buy for retirement. without a massive decrease in house prices (almost giving away 2 bed apartments?) and as you say, a big tightening up in regulation, i wonder if Spain will mainly now continue as a popular holiday destination for most. I feel that though many of us will continue to love to visit Spain for many good reasens, and for varying lenghths of time, many will be glad not to be involved any more than that in their system! I agree that the ‘investment’ buyer probably won’t consider Southern Spain again & no bad thing. I suspect that over the next 10 years that the half built cr.p developments will be demolished & hopefully something better put in their place, but will compensation be paid? If the government wants us to keep coming back it will have to be. I can’t see any real recovery in prices for at least a decade. When you drive on the toll road from Malaga to Estepona and see some of the developments that have been or are being built there is little wonder that as someone said 50% reduction is possible. Some of these apartments I recon are valueless, on the other hand ones that are well built and in good locations will be less affected. It’s ironic that this topic is the other way round in the UK – how many want to join the Euro. I wonder what a poll on that would reveal.